The revitalization of downtown Mobile and all its parts began with Main Street Mobile, an organization that has served as the “keeper of the vision” for the area since the early 1990s. Along with efforts from the Downtown Mobile Alliance, and the implementation of street lights, sidewalks, beautification projects and art installations, Lower Dauphin and its surrounding parts have served as the hub for residents and visitors alike to gather and celebrate the historic heritage of the city. To the amateur eye, it appears that restaurants are the key benefactors for the area’s success. “Most Downtown organizations consider restaurants the main part of the retail mix,” says Carol Hunter, communications director at Downtown Mobile Alliance, “and in that respect, we have experienced great success.” But developing a traditional retail market has proved more of a challenge. Small victories like these create success stories for countless venues on Dauphin Street. Some, like Naman’s, A&M Peanut Shop, Three Georges and Olensky Brothers, just to name a few, have prospered for decades. Others, though, more recently opened their doors to the new age of downtown Mobile, thriving in the community with boundless energy and high hopes for future prosperity. Urban Stiles | 451 Dauphin St. 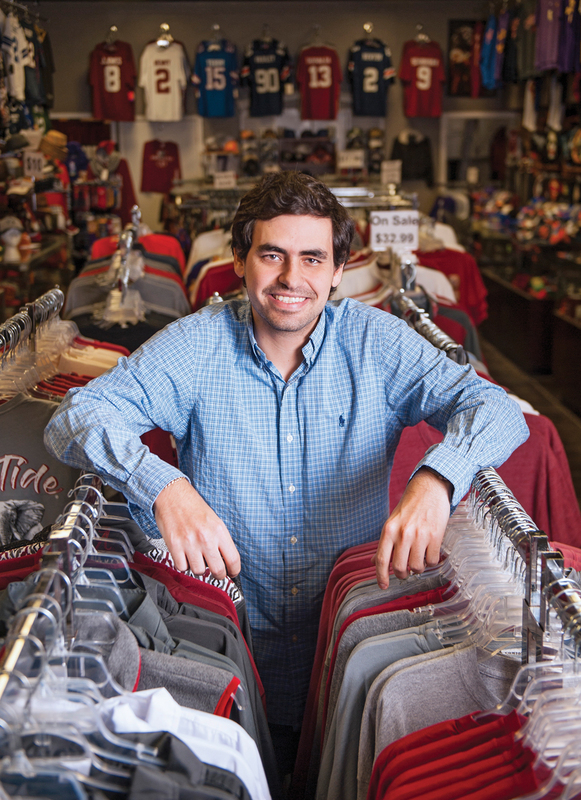 The Downtown Mobile Alliance brought their retail initiative, Urban Emporium, to fruition seven years ago as an incubator for aspiring entrepreneurs. 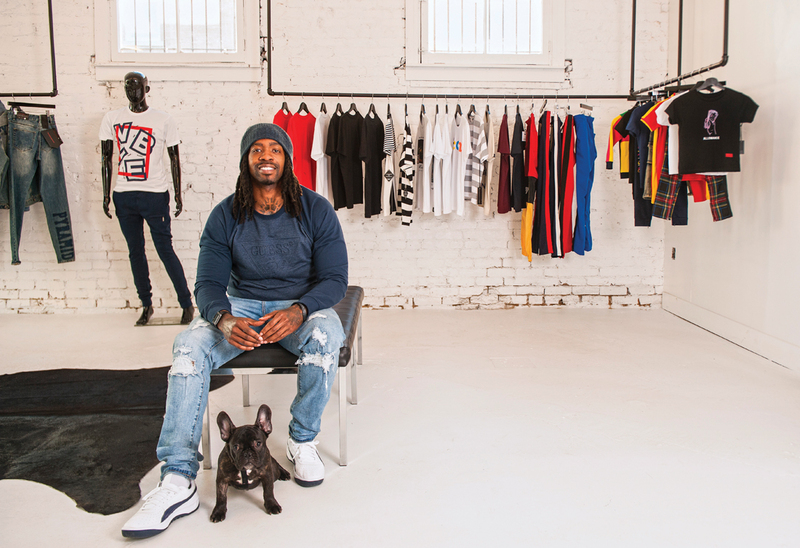 Urban Emporium trains vendors and retailers selling boutique clothing, jewelry, pet products, food, toiletries, toys and other niched brands on how to manage a retail space and navigate the transition to their own Downtown presence. 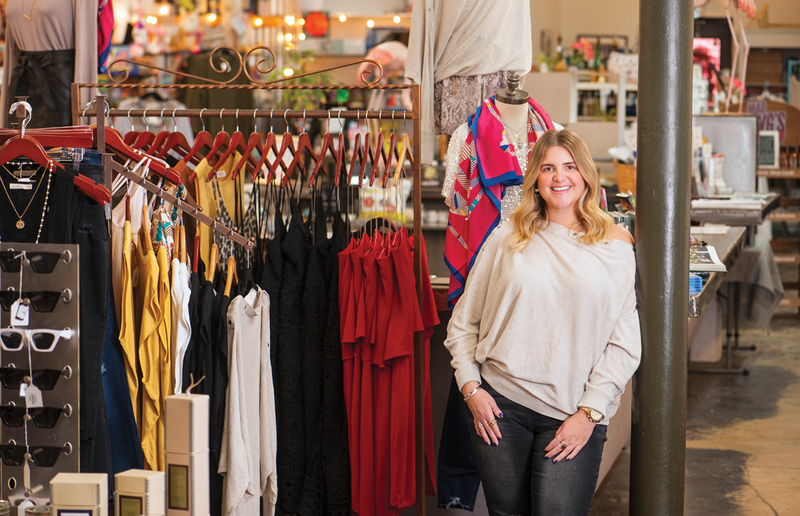 Local entrepreneurs flock to Urban Emporium to test the waters of a business venture with minimal investments and support the broader goal of creating a culture of entrepreneurship in Mobile. Urban Emporium | 260 Dauphin St.
An outgrowth of Urban Emporium, Covered Boutique serves women of all ages that frequent Lower Dauphin. Their styles accommodate shoppers for every season, combining trends with classics on the spectrum from classy to casual. The atmosphere is vibrant and luminous from the moment you pass through the window display onto the cheery, clothing-lined showroom floor. Once you find a fit for yourself, peruse the section of playful gifts, from water bottles and clutches to trinkets and sparkling jewelry. Leaving is much more satisfying with not just a bag in hand for yourself but a little something for someone else, too! Covered Boutique | 222 Dauphin St. The Naman family has a Downtown retail legacy spanning more than 80 years. Passed from original owners Emile and Virginia Naman to their children, the premier men’s clothing storefront, Naman’s, occupies two lots near Bienville Square. The Namans’ daughter, Monica Naman Setterstrom, however, sought a younger clientele on the same block — for the past 25 years, she has marketed kids’ clothing at Attractions Children’s Apparel. Tucked on the racks amongst over-the-top pageant gowns and children’s formalwear hide charming Southern pieces for every style, from smocked dresses to seersucker. Sweet holiday attire and crisp white John-Johns entice visitors from all walks of life and make Attractions a must-stop shop. Attractions Children’s Apparel | 207 Dauphin St.
Patrick Setterstrom, the Namans’ grandson and owner and operator of The Vault. Patrick Setterstrom followed in the family footsteps as well when he expanded the brand once more, opening The Vault in 2014. Pop culture paraphernalia from athletic jerseys to entertainment industry gear line every inch of the store, both inside and out. Graphic tees stand right in line with gag socks and trendy accessories. Even local Mobile-centric merch has a spot on his racks. It’s the perfect spot for the hard-to-shop-for young man in your life, but everyone in the family, from the football fan to the music lover and others in between, can find the perfect piece at The Vault. The Vault | 205 Dauphin St.
MoonPie-loving Mobilians, rejoice! The MoonPie General Store on Royal serves breakfast, lunch and MoonPie-laden desserts for anyone feeling nostalgic for a diner bite. But don’t stop at the kitchen. The shelves around the store are lined with MoonPie memorabilia and plenty of vintage-inspired finds, from gift boxes to novelty apparel, and Mardi Gras goodies galore. MoonPies are great at Carnival time, but just as tasty all year round! The Mardi Gras shopping doesn’t have to end on Royal Street. The flag-lined walkway in front of Mardi Gras & More is hard to miss — and the merchandise selection within shouldn’t be. Owner Jeff Jordan started selling trinkets out of a booth in the ’90s, and in 2004 he opened shop in a building his family has owned since the ’60s. The store’s biggest asset is the printer that inks every T-shirt and canvas on display in the store. If you’re lucky, you can catch the original 2019 Mardi Gras print, but be quick — he only prints 200! 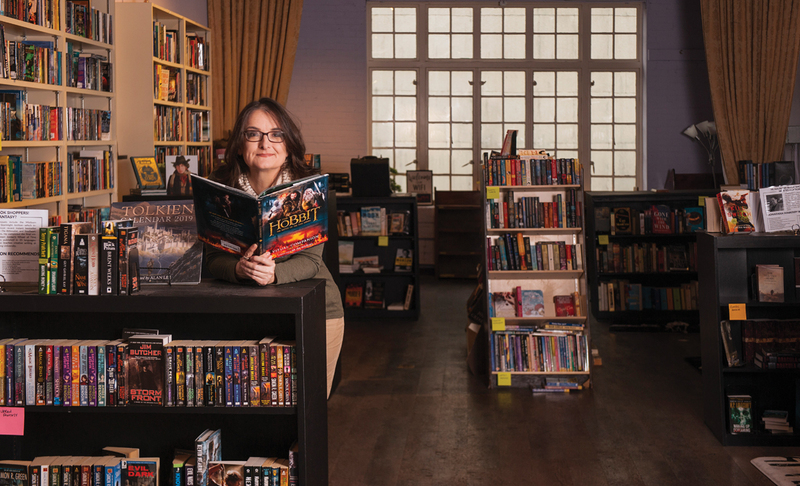 Mardi Gras & More | 457 Dauphin St.
Angela Trigg, owner of the re-established Downtown jewel, The Haunted Bookshop. The ghost of a piece of beloved Downtown history is the newest iteration of The Haunted Book Shop, a family heirloom nearly 80 years in the making. Angela Trigg, granddaughter of original Haunted Book Shop owner Adelaide Marston Trigg, worked at Bienville Books from 2011 until its recent closing. When the opportunity arose, she seized it to reopen her family’s store in the late bookstore’s shell. Find local literature recommendations in the window displays and on the shelves, and keep this local spot on your list. The Haunted Bookshop | 109 Dauphin St. The extra-special ladies in your life — those so special you stand beside them at the altar — will swoon over the exclusive selection at Bella Bridesmaids. The appointment-only bridesmaid dress boutique offers countless designer pieces in every style, fabric and color. Owner Mary Kendall Butler can also outfit you for formals, Mardi Gras balls and other special occasions. Bella Bridesmaids | 7 N Conception St.
BackFlash Antiques | 9 S Joachim St.
Olde Mobile Antiques Gallery | 653 St. Louis St.
Sophiella Gallery | 111 Dauphin St.
Gallery 450 | 300 St. Michael St.
Bienville Souvenir and Gifts | 6 S Conception St.
Royal Pharmacy | 1 S Royal St.